With method A, you can define your own coding for enhancements with a function enhancement. Method B makes it relatively easy to select new fields without spending too much time on them. Enhance the standard extract structure with an append structure. Fill the new fields with the function exit. 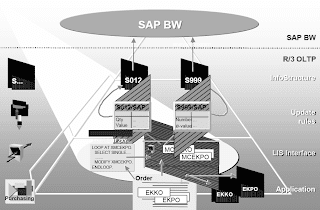 Create a new view or an ABAP Query Info Set. Overwrite the extractor for BW and the extract structure in the maintenance function for Data Sources (master data attributes). Method A: Enhancing the extract structure with a customer append and filling the fields with a function exit. This method can be used with the 'view', 'ABAP Query', and 'Function module ' extraction types. Do not change the standard view.Create an append structure and define your new fields (attributes). Fill the appended fields using the function exit EXIT_SAPLRSAP_002. The original fields are filled by the extractor. 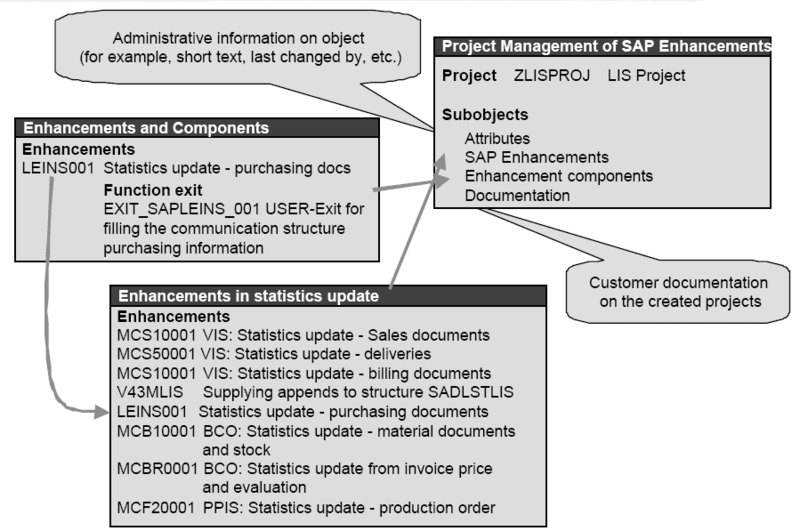 Method B: creating a new view or ABAP Query functional area. Overwrite the extractor for BW and the extract structure in the maintenance function for characteristics (RSO2). 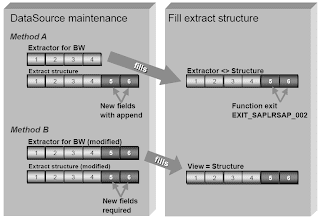 Create a new functional area or view.Enter the functional area or view in the Info Object maintenance facility as an extractor for the BW and an extract structure.All of the fields are inserted in the extract structure automatically by the generic extractor.This is referred to as a modification. At present, you have to reassign the view to the Info Object after the next upgrade. This will be carried out in future by the version management function. In the first step, enter the application component and choose the corresponding source. Then choose Enhance extract structure and confirm (in most cases) the default name of the customer appends beginning with 'ZA'. Then maintain the fields that you want to enhance later. All of these fields should start with 'ZZ'. Finally, generate your append structure. 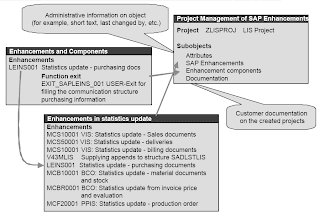 In the enhancement RSAP0001 you can use the enhancement component EXIT_SAPLRSAP_002 for supplying master data (and texts as of 2.0B). I_CHABASNM: Name of basic characteristic. I_T_FIELDS: List of transfer structure fields. Only these fields are filled in the data table and can be addressed correctly in the program. I_T_DATA: Table with the data obtained from the application API. I_UPDMODE: Transfer mode, as requested in the Scheduler in the Business Information Warehouse. Usually not required. I_T_SELECT: Table with the selection conditions stored in the BW Scheduler. Usually not required. Once the function exit is used, it is called with each extraction ('CASE' statement required). Key fields for the enhanced Content must be available. User exit is only specific to the append fields. Do not change field contents and do not add data records! Maximum field length is 32 characters. Text and master data may be time-dependent. Remember that this is a modification. At present, you have to reassign the view to the Info Object after the next upgrade. This will be carried out in future by the version management function.The modification method has the advantage over the enhancement method in that accessing data directly via a new view or functional area is naturally faster than enhancing data in an exit. The extract structure for hierarchies is fixed. 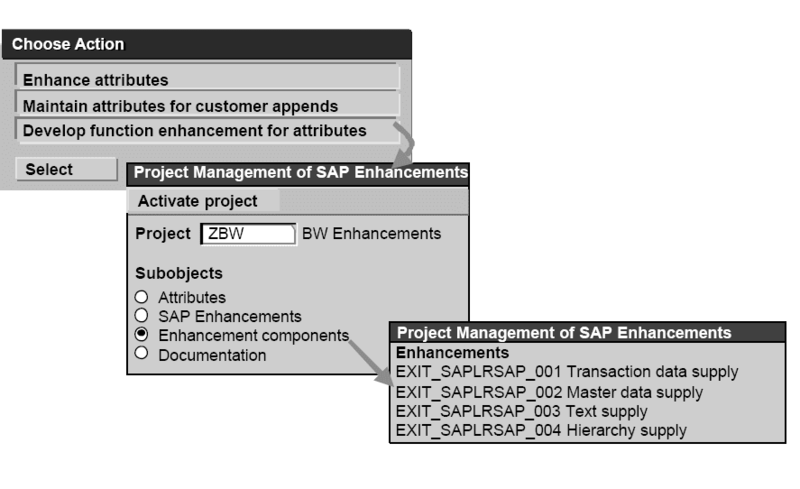 Call the function exit EXIT_SAPLRSAP_004 for changing the hierarchy from the Implementation Guide. Change the relevant fields in the internal tables. 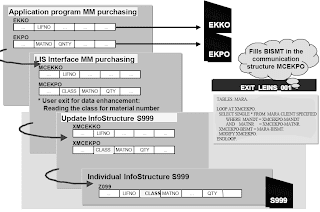 The complete hierarchy is available in the function exit. 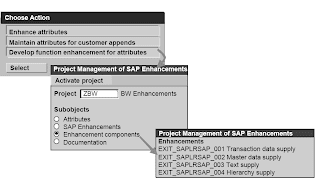 The function exit EXIT_SAPLRSAP_004 allows you to change the contents of the transfer tables created for a hierarchy request. This can be useful for customer-defined hierarchy classes. This module, however, should not be used to change the contents of key fields; this should be done in the Business Information Warehouse! C_T_HIETEXT: Table with the description of the hierarchy in the requested languages. I_UPDMODE: Transfer mode, as requested in the BW Scheduler. Is not usually required. There are also options for enhancing data within the application runs in R/3, to help you update the data into BW.This applies in particular to information (characteristics/key figures) that is available at that moment or that can be read easily. You can derive data by using an enhancement for generating characteristics and key figures. To do this, you have to fill the user-defined characteristics and key figures in the communication structure with values, using the relevant application enhancements when the data is updated. What does "User Exit" mean? 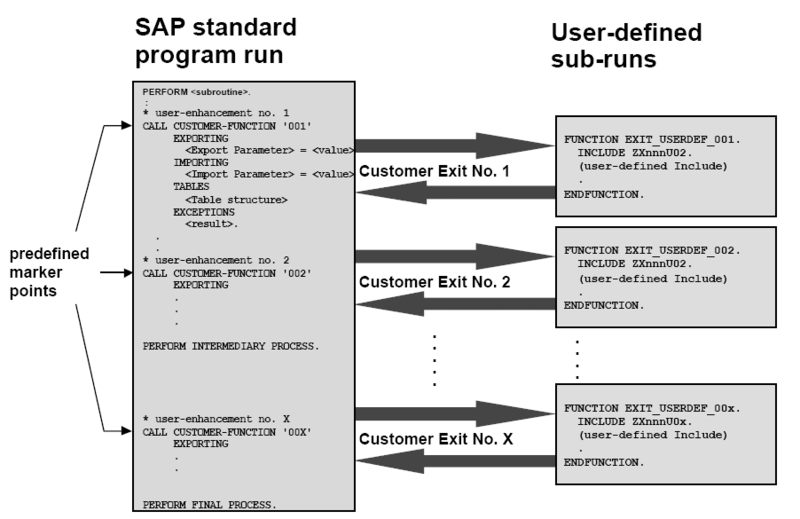 Use User exits to branch to predefined points from the SAP standard program run into user-defined subprograms. 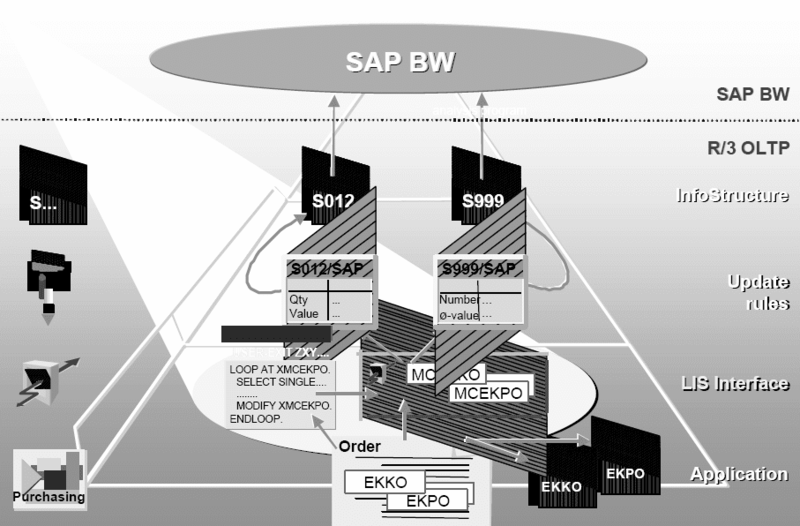 This completes the standard functionality by a few aspects.This gives SAP software the highest possible flexibility. The user-defined codes are managed as isolated objects in the customer namespace, so there is no worry of complications with the next release or when correction statuses are implemented. You have to create a project before you can use an enhancement like this to fill the communication structure fields.You can then integrate one or more enhancements into this project. Remember that an enhancement cannot be used in two projects simultaneously. LIS has the following enhancements for statistics updates. Every enhancement could have more than one enhancement component. These components have the code for filling the communication structure, stored in an INCLUDE. 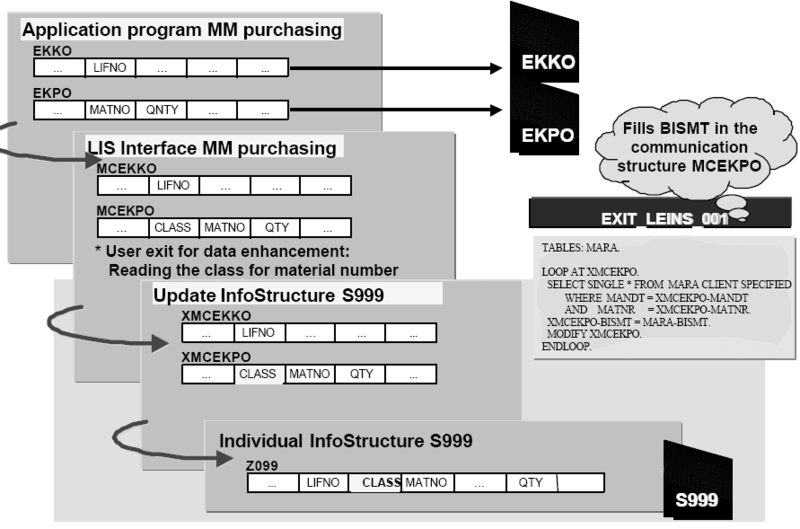 The user exits in the area of the LIS interface are called up by the application after the communication structures are filled.This means you can access the standard filled MC structure for your data enhancements.Keep to the following procedure when enhancing the communication structures for new characteristics that need to be filled using an enhancement.The new characteristic (data element) must be defined in an APPEND structure, which is attached to the relevant communication structure. 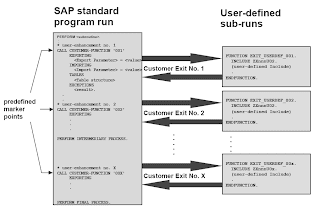  In a second step, the new communication structure characteristics must be read into a field catalog for the application, so that they can be selected in an information structure.So that the new characteristics can be supplied with values in the communication structure, the ABAP code must be in the function enhancement. It must be stressed at this point that this is only necessary if you cannot transfer the information with a MOVE-CORRESPONDING from the relevant document file.